This article was shared with me in 2010. I downloaded it in 2011 with the intent to share it. Finally I get around to it 9 years later! Be aware, as of today, The Blue Goose is open for business, although limited hours. https://www.facebook.com/thebluegooseSamaria/ The Facebook page has a number of historical photos of The Blue Goose. This is the Historical Sketch shared with me regarding The Blue Goose. “Until recently this building, owned by Merrill Price, had been a thriving business of one sort or another since its construction just before the turn of the century. 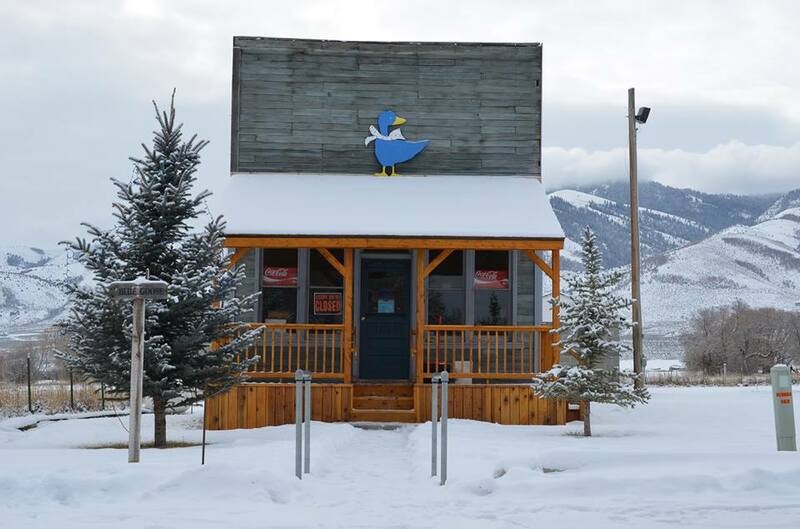 Most remember it as The Blue Goose, a local hot spot of Samaria, Idaho. “Charming and unique, the structure was originally built for living quarters and a furniture store by Isaac Ike Evans. Organs, rockers, bureaus and other fine wood furnishings could be purchased there and the only furniture store in Samaria at that time also served as a post office to a population of over 800 people. “Later on, the furniture store was converted into a candy kitchen. The new owner, D.D. Williams, sold pop and confectionaries, and had a pool table. Many remember stopping as youngsters on their way to Mutual to share a soda and socialize. They were always reminded not to be late for their church meeting by Mrs. Williams, who would usher them out the door at ten minutes till. Later the teenagers would reunite there to pick up where they had left off. “A barber chair was also in the south corner of the candy kitchen. The late Ernest Williams recalled to me many a lazy afternoon spent indulging in second hand gossip and of yesterdays bygone. “A 1936 calendar hung on the abandoned building’s wall when around 1945 David Bronc Jenkins and Muddy Waters (a nickname – no one seems to remember his real name) took over the building to open it as the local saloon and pool hall. Card games were a favorite past time and a nickel a cue could buy a splendid time of pool hustling. “Since then, the lease of the Goose slid through many hands. To name a few, Ralph Hughes, Waldorf Morse, who gave it up to become Samaria’s school teacher, Ariel Jones, Wally Nicholas, Ralph Williams, Arthur Doc Smith, Ted Loomis and finally Bill Thorpe, the last owner of the lease. “Many names have been pegged on it since that time such as The Samaria Bar, The Nugget, The Second Ward, The Bucket of Blood, and most everyone’s favorite, The Blue Goose. “Often, as a little girl, I would trod barefoot down the hot oil road to stand hesitantly outside its door, then almost recklessly make my pretense début. My father would be too involved in his card game of Cassino to raise an eyelid in acknowledgment of my statement, The cows are in their stalls waitin to be milked, Dad. “Can’t leave now, would be the mumble that came from lips which were also juggling his Pall Malls. Got one more hand to play. Wait on the porch and Spug will bring you a soda. “Now, to a child who is just learning her A.B.C.’ s and how to count, one became the most versatile number in our numerical system for although I know at least five hands had been played, can of soda, two packages of peanut M&M’s and one bellyache later, my father always swore to my mother (who by this time had already started the milking), Jest had to play that one last hand. “Today the Goose stands empty. Weeds grow where once was smooth trodden earth. No dim light slithers out into the night to say a friendly Hello, I’m open to passersby. No more tales absorb into the paint-thirsty woodwork on lazy summer afternoons. No smoke curls out from the chimney ascending to a stark winter’s sky. No more ringing of the cash register to signal the sale of an ice cream, a soda, or a beer. But it stands, a structure representing people past and a memory for us in the present. This is another photo that was recently provided to me by a cousin. She did not know if we are related to him or not. Here is the photo and I can indicate I am not related, and I do not believe she is directly either. Since I did not see the photo available elsewhere, I thought I would make it available just in case it is a one of a kind. 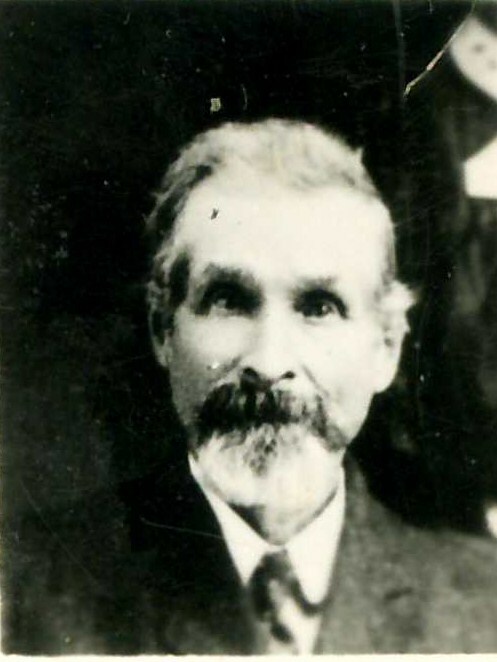 William Mills was born 4 November 1839 in Spurstow, Cheshire, England. The back of the photo has “Wm Mills 4 Nov 1839” written on the back. He married Margaret Ann Hawkey on 1 June 1867 in Salt Lake City, Salt Lake, Utah. After she died, he married Caroline Virginia Hughes 13 December 1883 in Salt Lake City. He died 10 November 1910 in Paradise, Cache, Utah. He was buried 14 November 1910 in the Paradise City Cemetery. Yep, another day on the travel route ending in Virginia. This morning we arose at the home of Joseph and Alyson Shepperd, but we were alone. Now if you want to know kindness, they gave up their bed and slept on cushions on the living room floor for us. If that is not sacrifice for your brother I do not know what is. That is true religion! When we awoke, they had already left for work. We were tired enough that we slept in until about 9:30. We arose and got ready for the day and finally headed out a little after 10:00.
only feet away from where the actual events occurred. is really worthy of the site that is currently present. Perhaps someday. I surely hope so. We took Noland road out, hopped back on I-70 and headed south to Branson. We stopped, ate, picked up some fuel, shopped for souvenirs and headed the rest of the way. For some reason or another I felt really tense and really wanted to get to our destination, especially where it was so close. Passing near Collins, Missouri I started watching out for the road to get to my cousin’s home. I knew it was in Humansville (actually Arnica) and should visit. Well, I took M, when I should have taken N, and ended up 20 miles off the mark. For nearly 3 hours we searched before we finally found my families home. When I did find a signal to call, I phoned Bryan, Amanda’s Dad, to ask for direction. He told us we were supposed to be going off of N rather than M, so we backtracked and headed off that direction. But before he could have mentioned AA to me, if he would have, we lost our signal. So we wandered for a long time before we figured out we also needed AA. When I finally found what was familiar, then we got lost in the maze of roads on their property! Ugh. By the time we were there, the sun was getting closer to setting so now I was antsy to get going so we could get out of the country before having to wander all night. Nonetheless, Tammy was taking her family to Stockton for fireworks so we were able to follow her out. We ended up showing at Branson a several hours late. Jason and Mara Hughes still had the chili on for us and we enjoyed a meal with them. We ate and visited until about midnight thirty. We then headed off to Andy and Becky Hughes house to stay the night. We stayed up and visited with them until 2:00 AM about everything from birth control the Liken the Scripture movies and people we know in them. Funny where people you know end up. Anyhow, it is time to crash for the day. Tomorrow (now today) is our day of rest.